Uluwatu Beach is known as one of the top 5 surf destinations on our planet, suitable for professional surfers. Located in Pecatu the southern part of Bukit Peninsula, this place is visited by hundreds of surfers and ordinary people every year. It is interesting to mention that the place got its name from two Indonesian words – ulu which means lands end and watu which means rock. Once you see this area, you will know why. Uluwatu Beach Bali was placed on the surfers’ maps back in 1972 when the movie dedicated to surfing called Morning of the Earth filmed here was released. What is interesting about Uluwatu Beach is that there are five different breaks known as the bombie, temple, outside corner, racetracks and the peak. Each of them has unique characteristics. This is also a place where you can find some bars, warungs, and restaurants and check the local cuisine or enjoy some international dishes. Despite all the amenities and the excellent surf waves, like Padang Padang. This location is not heavily commercialized than Legian or Kuta and you will probably find many free spots on the beach itself. Similar to other places close to the shore, this one has a lovely sunset. When this period of the day comes, you better unpack your camera or smartphone and start taking photos because you probably won’t find another place that has such breathtaking sunset. First and foremost, this seashore is used for surfing. This means that you should take your board (or rent one here) and start surfing whenever you are here. Of course, this place has many other things to offer which means that it can be used by people who want a truly unique holiday experience. For instance, you can check the bars where you can sometimes find live performers or karaoke shows. Remember that this area is usually active only during daytime, but there are some exceptions though. Additionally, it is a smart move to visit some of the warungs, These establishments are offering fresh, nutritious food from Bali prepared in a traditional way. One of the main reasons why people are going to Bali, and places like Uluwatu Bali, is to find peace and relax. If you want to achieve this goal, you should try a nice massage session that can be provided on-site by some of the experienced masseuses that are covering this area. Close to this place, you can also find some spa centers which is another great way to unwind. So, the offer of activities in this location starts with sports activities and ends with parties and/or relaxation. One of the Best Places in Bali. As we already said, Uluwatu Beach is a true heaven on earth for surfers of all categories. Yet, surfing pros will enjoy this area the most because there are a few different types of breaks of the wave. For example, the Racetracks is very fast while Temple provides hollow and long waves. 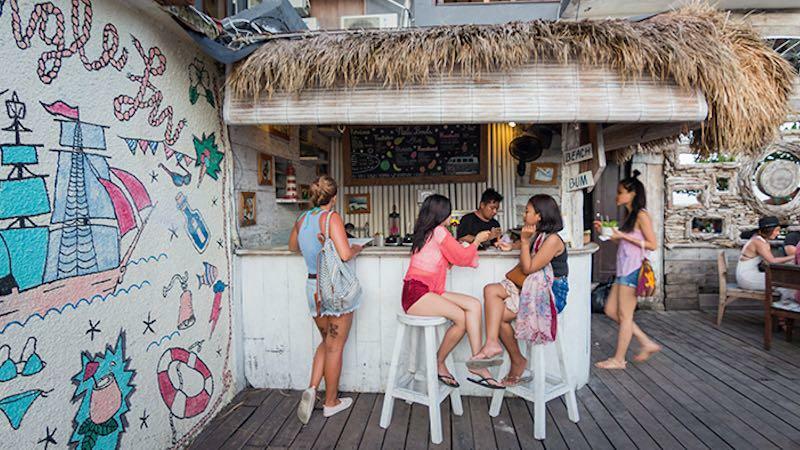 Situated on top of the stunning Uluwatu cliff, Single Fin is a world-renowned surf bar. Visitors should check the view and order some nice pizzas, snacks, and cocktails or try some traditional Indonesian dishes. This bar plays nice music too. What’s better than relaxing on a beautiful beach? Use this opportunity to get a relaxing massage that will bring balance to your body and mind. There are many women offering massages, but you can also try a massage in specialized parlors close to this area. When it comes to Uluwatu Beach weather, we must point out that Bali is an island that is part of Indonesia and the Indian Ocean which means that it has a warm and tropical climate. Simply put, the temperatures are more or less similar throughout the year and vary between 25 and 33 degrees Celsius. There is a distinctive rainy and dry season in Bali. In Uluwatu, the dry season is from May to October and the rainy season is from November to March. Keep in mind that the rainy season doesn’t mean that you will witness rain every day and it’s perfectly okay to visit this place in the rainy season. What this means is that you will frequently see heavy and more or less short rainfalls. 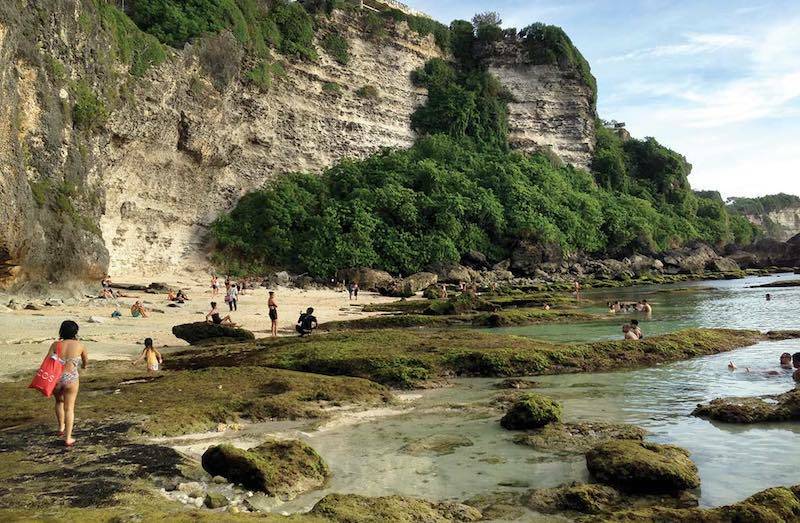 Basically, it depends on what you are planning on doing in Beach Uluwatu. Most of you will probably be interested in going there for surfing. If this is the case, you should know that the best period of the year for surfing in terms of weather is between April and September. It is also good to know that the water temperatures in South Bali are relatively stable too and they are usually around 25 degrees Celsius making them ideal for surfing. DO YOU WANT TO KNOW ULUWATU TEMPLE ? 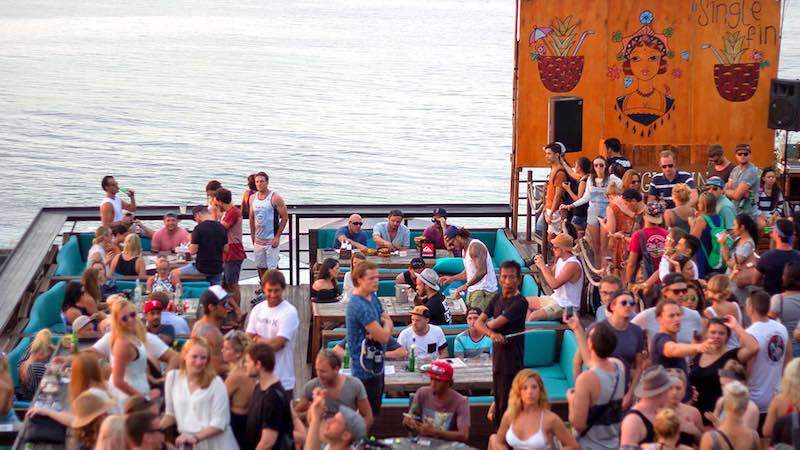 If you decide to go to this area, you will have to look for Uluwatu hotel. There aren’t many hotels located exactly on the shores of the sea, but they are located close enough. For example, you should check Blue point Bay Villas & Spa, Puri Uluwatu Villas, Delpi Hotel, Renaissance Resort Spa, and Moonlight Villa. Some of these hotels and accommodations are quite expensive, but there are some mid-range priced hotels and some cheap ones too. In other words, this is a place for tourists with all types of budgets. Obviously, the most expensive hotels have the best amenities. One of the best hotels in Bali is here Anantara Uluwatu Bali Resort. Finally, in order to get here, you will have to follow Uluwatu Map. Those traveling with a rent a car service should follow the Jl. Mamo. This is a decent paved road that will lead your straight to this area. In order to go down to the seashore, you must descend down the beautiful temple and go through two high rocks. This is a spectacular entrance. The closest airport is in Denpasar about 34 km north of this area. Of course, it’s always possible to get to this location by boat too. You can rent one or use some of the lines that are going around the island. 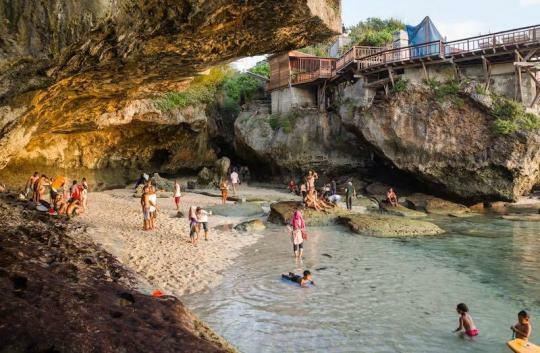 The mission of Bali Beach Web is to help people get familiar with the most popular beaches on the Island of the Gods, this web will help you discover the best Bali seashores for you. Copyright © 2018 Bali Beach Web. All rights reserved.